We did nearly nothing the entire day on Saturday. We slept in until late, grabbed a quick bite on the way to the beach where we stayed until after 5PM. I did take a brief look around the resort and here are some photos for you. When we arrived, we discovered that the Fontainebleau was hosting a pool party featuring R&B singer Ne-Yo. Will I be showing my age if I admit that none of us knew who he was? Mr. Fantastic googled him and we realized that we'd heard his songs, but never knew who the singer was. We didn't go see him, but we could hear him from our chaises on the pool. I can't tell you what he wore during his performance, but this is what he wore to his sound check. We lounged at the beach while our younger and hipper hotel companions crammed into the enormous pool area for the coolest pool party of the weekend. I wouldn't trade my view for the world. It was a wonderful weekend getaway. 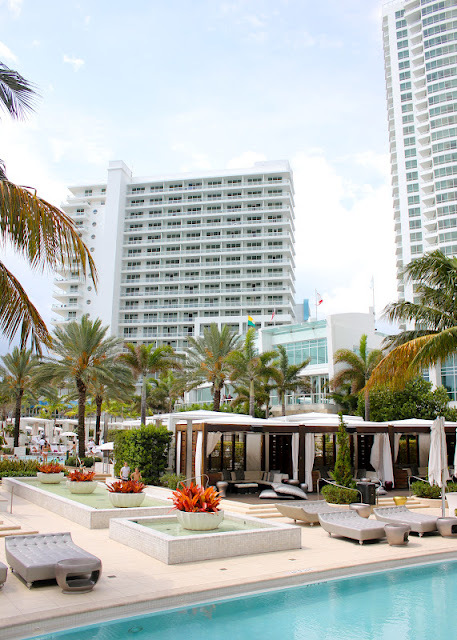 I basked in the Miami sun and Fontainebleau luxury and I loved everything about our stay. I just wish I'd known not to go until the last weekend in June when my secret crush Enrique Iglesias is performing in their BleauLive series along with Maroon 5 and others for the I Heart Radio concert weekend! While I LOVED the hotel and the property was beautiful, this is not the place I would recommend anyone stay if they are on a budget or traveling in a bigger group where charges add up quickly. My opinions are mine alone. I was not paid or influenced in any way by the Fontainebleau Miami Beach.